The internet has changed the road to rehabilitation. Peer support and therapy were once only available through Alcoholics Anonymous meetings and doctor visits, but today, thousands of people are now turning to online communities for support. Online support systems such as anonymous fellowship – while lacking a structured system – provide a sense of 24/7 accountability and monitoring. Reddit is also playing an important role in “social” sobriety with its community (aka subreddit) r/stopdrinking. 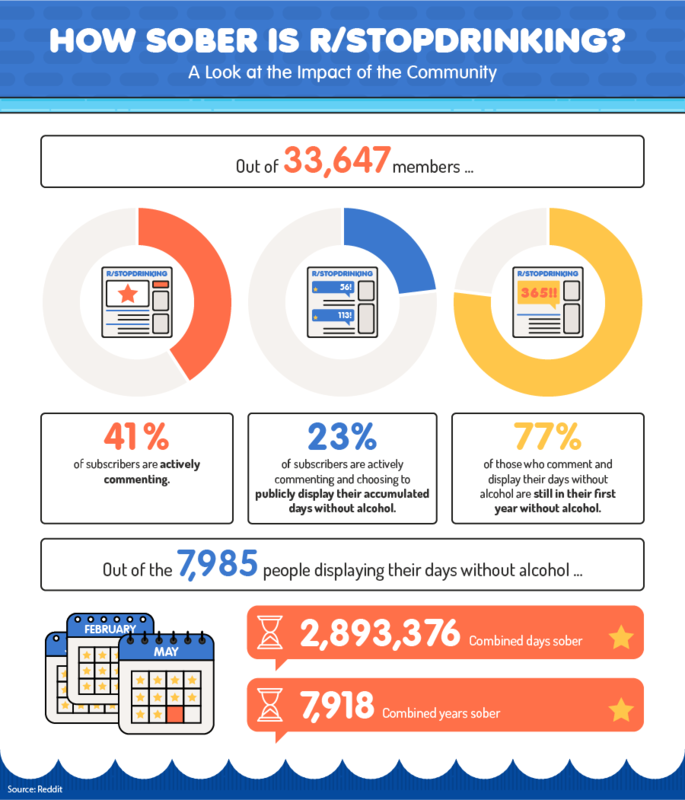 To see exactly how online support groups have a positive impact on recuperating alcoholics, we analyzed 369,000-plus comments on this subreddit within one year. As one of the largest communities for recovering alcoholics on Reddit, these data provided valuable insights about the road to recovery. Keep reading to see just how Reddit is used when it comes to influences those searching for sobriety. To understand how far r/stopdrinking has come as a powerful tool for recovering alcoholics, we first looked at its evolution. In 2013, the subreddit had 9,624 subscribers. The page saw an average yearly increase of 10,000 users – 19,249 in 2014 and 28,873 in 2015. These numbers are impressive considering that there are almost 234 million users on Reddit and 853,724 subreddits. 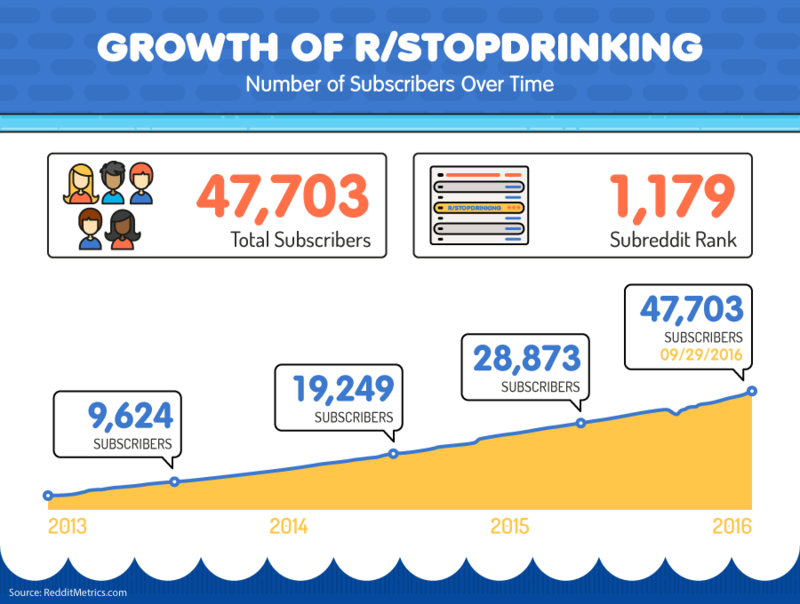 With almost double the amount of subscribers since January 2015, r/stopdrinking is among the top 1,500 subreddits. As of September 2016, the page had 47,703 subscribers. Comparatively, r/redditorsinrecovery had 7,633 subscribers, r/addiction had 4,078 subscribers, and r/alcoholicsanonymous had 2,133 subscribers. Although it’s great to see people from across the world fighting alcoholism together, this increase in subscribers also indicates that drinking is still a serious problem. While a majority of users are in recovery, the subreddit is also open to loved ones and anyone who might need advice, which could explain the increase in subscribers as a sense of community has been shown to be an integral part of recovery. At the same time, though, this increase could also be indicative of a larger problem. In the U.S., heavy drinking has increased more than 17 percent since 2005. More startling are the global statistics: Among those aged 15 to 49, alcohol misuse is the first leading risk factor for premature death and disability. Looking at these numbers, it’s no wonder that r/stopdrinking is ranked 1,179 for its number of subscribers. With its daily check-ins that allow people to pledge their sobriety and real-time chats that connect users in their times of need, r/stopdrinking has become a secure, anonymous source of comfort for those struggling. Next, we focused on member activity. While lurking – the act of observing but not actively participating – is a popular phenomenon on Reddit, members of r/stopdrinking are encouraged to remain active. Posts such as “CC to New Sobernaut: Why It’s Important to Post and Comment” and “Our Stories: Saturday Shares” are continuous reminders that group participation is an effective strategy to recovery and that all members have something to contribute. With 33,647 members in 2015, 41 percent of subscribers on r/stopdrinking actively commented on posts. Twenty-three percent routinely commented and chose to display their sober-days count. Additionally, 77 percent of those that commented and displayed their days without alcohol were still in their first year of recovery. Most notable: the combined days and years sober. Out of the 7,985 people who displayed their days without alcohol, there were 2,893,376 combined days. That translated to a collective 7,918 years. Although these numbers are impressive, reality reflects an even greater struggle. According to Medscape.com, less than 20 percent of people in recovery for alcoholism remain sober for a full year. At the two-year mark, the relapse rate is 40 percent, and only after five years are recovering alcoholics likely to remain sober. As grim as this may sound, r/stopdrinking still serves a purpose. Strictly enforced guidelines and facilitated conversations have created a safe space that promotes personal health and honesty. For those struggling with addiction, it’s often small things that make the most difference. Affirmations are one of those. 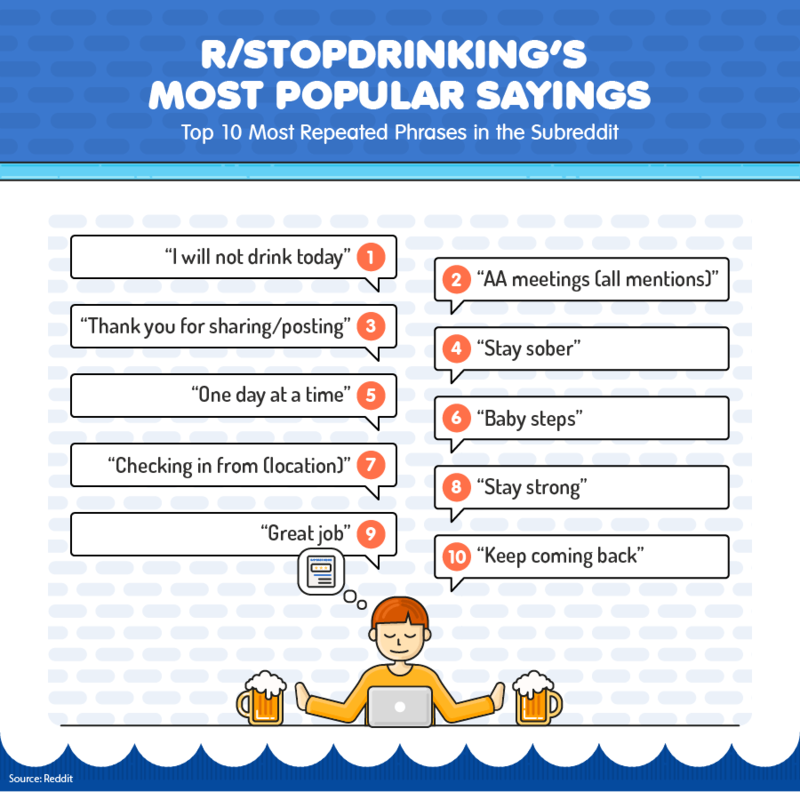 When we looked at the most popular and repeated sayings on r/stopdrinking, we noticed an overwhelming amount of positivity and companionship. The No. 1 saying was “I will not drink today,” while the No. 10 saying was “Keep coming back.” “Baby steps” and “One day at a time” also made the list. And although r/stopdrinking could potentially be seen as an alternative to Alcoholics Anonymous, “AA meetings” were also frequently mentioned. This peer solidarity – in the form of online posts and comments – is a crucial step in engaging and supporting recovering alcoholics, according to the Substance Abuse and Mental Health Services Administration (SAMHSA). The overwhelming positivity on r/stopdrinking is more than likely helping subscribers feel less negative emotions – a cornerstone of emotional sobriety. The forum is monitored for discouraging or hateful speech. And when someone relapses – as seen in this post – encouragement and uplifting words are exchanged. 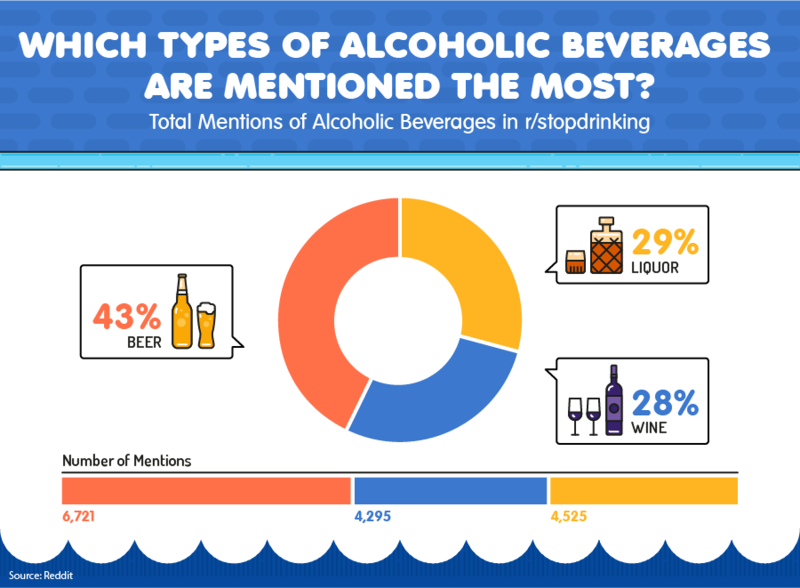 We then looked at the types of alcoholic beverages mentioned the most on r/stopdrinking. It’s evident that beer is the substance of choice for many – it had 6,721 mentions (43 percent). Wine was mentioned 4,295 times (28 percent), and liquor was mentioned 4,525 times (29 percent). Although beer, wine, and liquor contain the same type of alcohol – ethanol – beer could be a popular choice because people may feel they can drink more of it. In fact, a standard serving of beer is considered 12 ounces, while a glass of wine should only be 5 ounces. 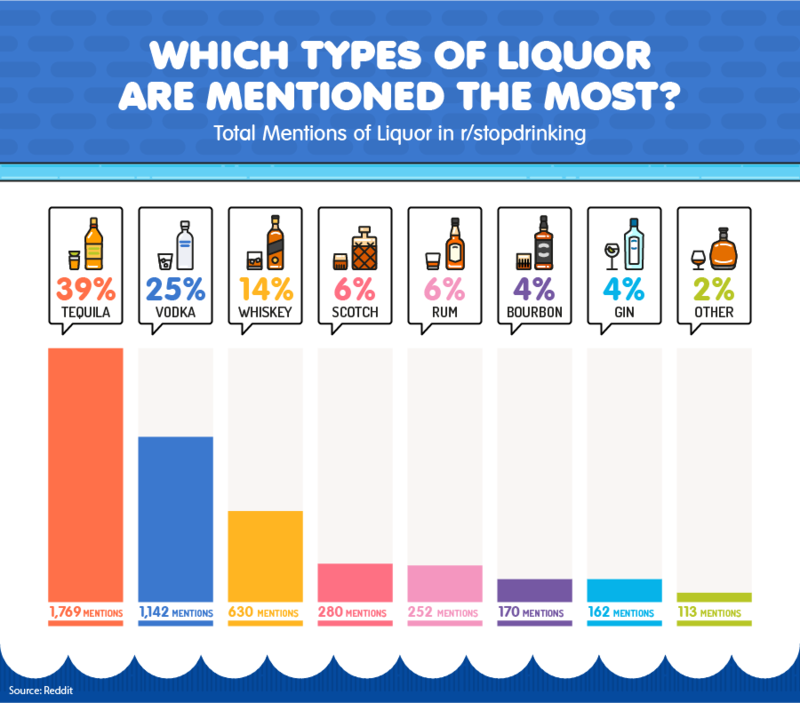 We then looked at the types of liquor that were mentioned the most on the subreddit. By far, tequila was overwhelmingly talked about – at 1,769 mentions (39 percent). Next came vodka with 1,142 mentions (25 percent), and whiskey with 630 mentions (14 percent). Looking at past comments in r/stopdrinking, it is evident that subscribers have a love-hate relationship with liquor. Posts such as “Drinking too much on nights out” and “Tomorrow’s the day I messed it all up” clearly illustrate that social situations and alcohol don’t mix with recovery. Social drinking may refer to drinking patterns accepted by the society in which they occur, but it can quickly get out of control for those who are prone to alcohol abuse. When it comes to alcoholism, people have a lot to lose. But although loss on the road to recovery can sometimes have a negative connotation, it can also mean something good. 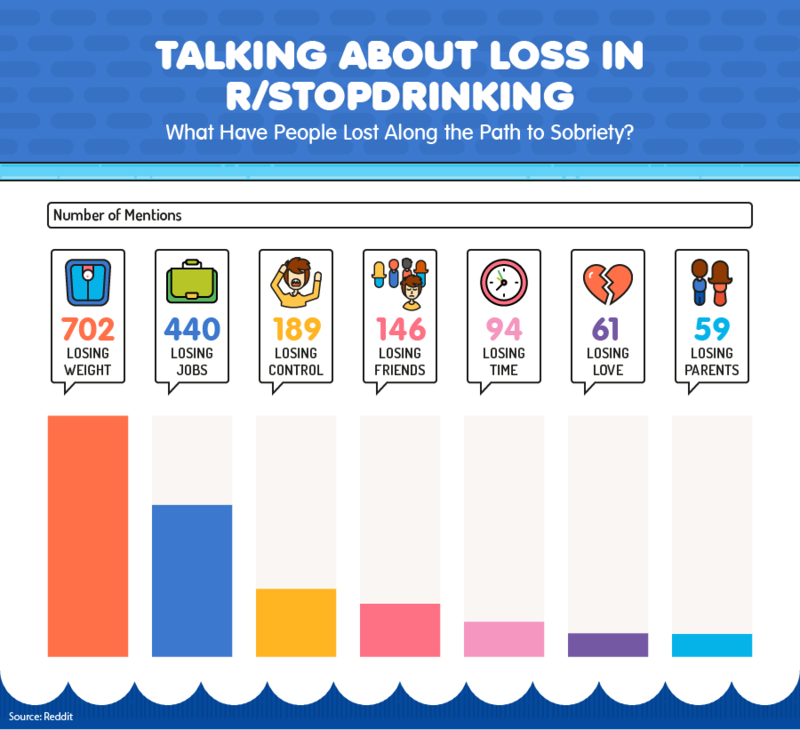 When we looked at how many times “losing” was mentioned on r/stopdrinking, the most mentions had to do with weight loss (702 mentions). And exercise is leading the way. Alcohol releases endorphins and withdrawal from it can cause levels of this bodily chemical to drop. For some, this sets depression in motion. To curb this unhealthy addiction, many are turning to physical activity – something that also releases endorphins. With posts like “On Exercise, and the Absurd Benefits of…” and “Alcohol on the brain? Why exercise can be helpful,” it’s evident that exercising is not only helping users overcome a debilitating disease but also helping many overcome underlying issues – such as depression and anxiety. The other mentions, many in reference to what was lost before becoming sober, were not as positive. Many subscribers experienced losing a job (440 mentions) as well as losing control (189), friends (146), and even time (94). The line between “moderate use” and “dangerous use” – when it comes to alcohol – can often be a slippery slope, slick with the contents of one-too-many drinks. Its a slope that many people are increasingly falling down. For those who have embraced technology on the road to recovery, r/stopdrinking is a constant companion. Over the past few years, it has seen considerable growth – with more than 47,703 subscribers as of September 2016. Its members, committed to honesty and responsibility, proudly display their numbers of days sober. Daily discussions about relapse and alcohol fill the front page, and positive affirmations are freely given to those who may need them the most. While Reddit is often used to procrastinate, r/stopdrinking serves a greater purpose. It is a safe place for those battling an invisible disease. The beauty of it all? No one has to fight it alone. If you or someone you know is struggling with alcoholism or substance abuse, Recovery.org has answers. On top of straightforward education on a number of topics including tolerance and alcohol abuse, Recovery.org also provides specialized treatment services for every individual. We scraped every comment from the r/stopdrinking community in 2015. With over 369,000 comments to review, we processed the text and phrase data with an analysis tool to come up with our findings. The graphics and analysis on this page are free for you to use. We only ask that you link back to this page so that all information is available to your audience and our authors are recognized.